There have been hotels at this strategic location since 1853. The nearby mills, river crossing and business district made it an ideal location for travelers and tradesmen passing through town. The original hotel on this site, the Winslow House, was a two-story brick building. 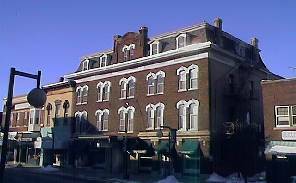 It was Cedar Falls' third true hotel, competing with houses owned by E. D. Adams (1850) and J. F. Jaquith (1853). The Winslow was sold in 1858 to J. O. Carter, who renamed it the Carter House. Carter remodeled the original building, adding a third story. The Carter House was torn down in the 1870s, and the Burr House was built in its place. Two brothers, T. J. Burr and A. N. Burr, owned the Burr. Their hotel was described in 1893 as "a modern house, brick, four stories in height . . . a model one in neatness and finely finished and furnished from top to cellar. The cu[i]sine varied, good clean beds, the service is as good as can be found in Iowa. It is a popular house and well patronized." After the death of T. J. Burr the hotel was sold to a group of Cedar Falls businessmen. They removed the ornamental iron balconies, enlarged the building, and renamed it the Black Hawk Hotel. The Black Hawk Hotel and Motor Inn continues in operation today. Its secondary function as the Cedar Falls bus depot recalls the town's early days, when stagecoaches brought people to and from the same spot.